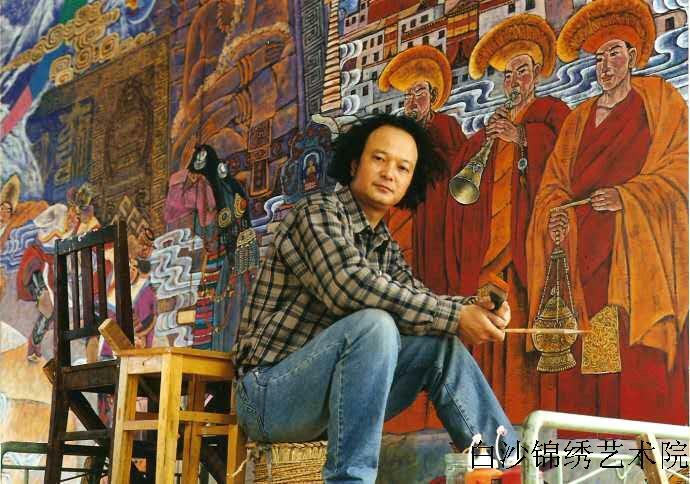 Born in Lijiang of the Naxi tribe, Yunnan province,in 1958 and graduated from the Fine Art Department of Beijing’s Central Academy of National Minorities in 1987.He always has been devoted to the study of modern Dongba-style painting and is one of the most representative pioneers in the modern Dongba style painting. 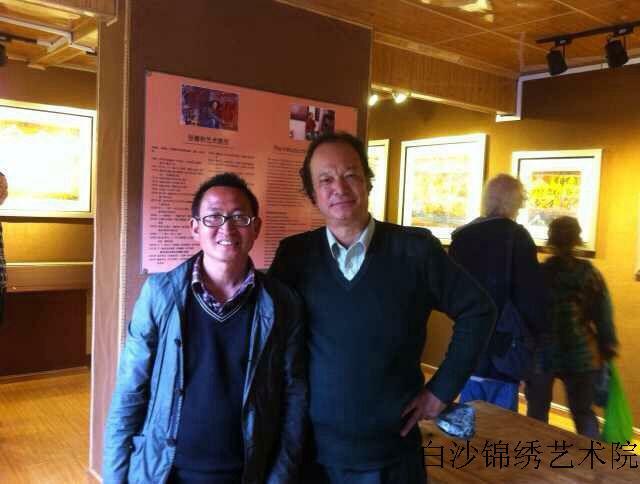 Currently working as a production designer at the August 1st Film Studio in Beijing,while serving as a member of China Artists Association, Director of China Murals Association,Vice-Chairman of the Association for the Promotion of Dongba Art＆Culture in Beijing,Vice-Chairman of the lnternational Society of Naxi Studies.Zhang is also a member of the Murals Committee of the Architectural Society of China. 1987: solo exhibition in Beijing.1990: organisedan art exhibition inJapan.1992: The 1st Contemporary Art Exhibition,lsrael and s soloexhibition in Beijing.1993: took part in exhibition at the Embassy of Mexico, Beijingand inGermany.1994: joined exhibition at the Embassy of Romania in Beijing, and inGermany.1998: exhibited in Beijing and won the Best Workaward for The Temple of Dongba at the National Mural Grand Exhibition.1999:twomurals selected for the National Mural Grand Exhibition.2000:entered Shangri-Lafor The 9th National Art Exhibition and a solo exhibition inSingapore.2004:Soldiers Marching across Yunnan:Celebration chosen to enter the 10th National Art Exhibition. “The works of translation carried out bythe Dongba Culture Research lnstitute,in a state of urgency, are not justattempts at“literaryrescue”,but also “pictograph rescue”,since the use of pictographs is fast disappearing. I was born in a small Naxi village located at the foot of the Jade Dragon Snow Mountain in Lijiang, with great passion and mission feels, I came to Beijing alone and finally find my own creative area. 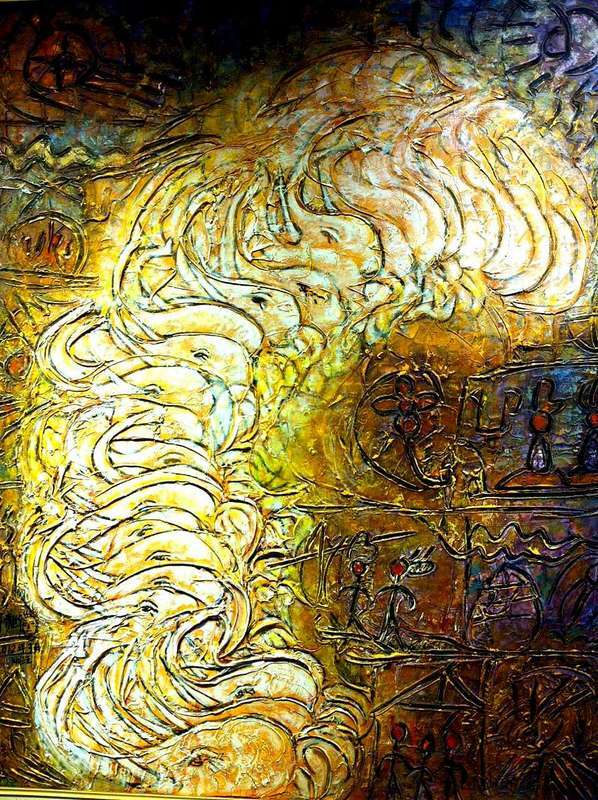 In my creative process, I am always been intoxicated in the free style to express my inner truly feelings through my modern Dongba paintings.With deeply breathing the life-force of nature, I try to look closely to the ancient Dongba culture and its unique characters. Just feel like a listener between the contemporaries and ancients. I took the road of creating modern Dongba paintings without hesitation. Every time i mmerse fully to the creative process, it ls like entering into a sort of visionary state of mind, which transcends the ordinary, every day world. In this state, I can literally feel the soul of our people's venerable ancestors touching me, triggering a chain reaction of creative inspirations inside me. In my work, I want to visually express the unending Karmic riggles of human life:birth and death, reality and illusion, good and evil. I attempt to merge my inner world into the vast universe to better express the union and nature and mankind, the continuous dialogue. Long time ag our Naxi forefathers created the mysterious art to Dongba paintings as a way of articulating specific religious beliefs. I however paint because I like to express my creative spirit and as a way to invite the viewer into my inner world.